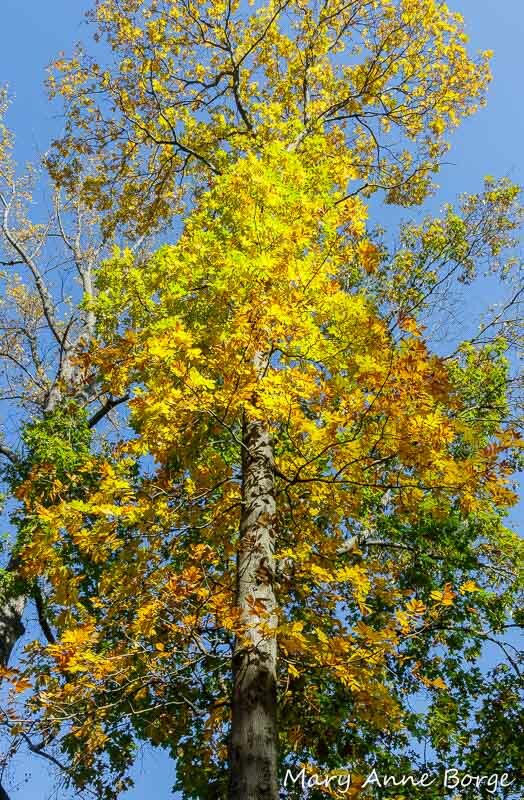 The compound leaves of Hickory (Carya species) trees still clinging to their branches are displaying colors that remind me of crayons: yellow-green, yellow-orange, lemon-yellow, chestnut, burnt umber. Together with the reds and browns of Oaks, the tans and peach of American Beech, they are part of the mid-fall forest pallette. Shagbark (Carya ovata), Mockernut (C. tomentosa) and Bitternut (C. cordiformis) are the Hickories I encounter most often. Those Hickory leaves may have supported up to 200 different species of butterflies and moths as food for their caterpillars, all without any negative impact on the appearance of the trees. Some of the species Hickories support are Banded and Hickory Hairstreak butterflies, and many moths, including Hickory Tussock, Yellow-shouldered Slug, and the dramatic Hickory Horned Devil, the largest of our native North American caterpillars. Banded Hairstreak on Indian Hemp (Apocynum cannabinum). Banded Hairstreak caterpillars eat Hickory leaves, as well as some other woody species. The aptly named, athletic, Hickory Horned Devil caterpillar. All of those caterpillars are fair game for birds, looking for food for themselves and their growing offspring. Insects, especially caterpilIars, are an important source of food for birds. It can take thousands of caterpillars to raise a hungry clutch of baby birds. Some caterpillars may fall victim to other predators, like spiders, predatory wasps or flies, and assassin bugs. Brown Assassin Bug (Acholla multispinosa) on Bitternut Hickory bud. Hickory nuts also supply food for animals, including people. The husks have four sections that split open to reveal the hard shell protecting the nut ‘meat’ inside. Mockernut Hickory (Carya tomentosa) nuts split partially open, like this one. Eastern Chipmunks, Red, Gray, Fox and Flying Squirrels, Raccoons, and rabbits all eat Hickory nuts. Squirrels may bury some of the nuts rather than eating them right away. This habit helps to disperse the Hickories if the squirrels don’t come back and eat the nuts at a later date. Fox may also eat Hickory nuts, or they may eat the smaller animals who eat the nuts. Wild Turkeys, Bobwhites, Red-bellied Woodpeckers, Blue Jays, Rose-breasted Grosbeaks and even Wood Ducks are among the birds that consume the tastier species of Hickory nuts. Hickory trees provide food and building material for humans, too. Shagbark is the species whose nuts are most often sold commercially. As you might guess from its name, Bitternut Hickory is not sought after for its nuts. Pecans (Carya illinoinensis) are in this same genus and are an important commercial crop. Hickory sap can be used to make syrup or other sweeteners. Shagbark is also the species whose wood is most often used commercially for making handles, ladder rungs, wheel spokes, flooring, and a hickory-smoked flavor for cooking. Named for its shaggy strips of bark, Shagbark Hickory stands out from the crowd. Can you pick the Shagbark Hickory (Carya ovata) out of the crowd? The bark offers warm, dry accommodations for insects and others trying survive the winter. Eastern Comma butterflies survive the winter as adults, if they can find a warm dry shelter like a space under the loose bark of Shagbark Hickory (Carya ovata). Mockernut Hickory also has distinctive bark, but in a completely different way. Its gray, smooth-looking, corky exterior forms sinuous ridges along the length of the trunk. Mockernut Hickory (Carya tomentosa). Notice the curved ridges in the bark, especially in places where branches have fallen off. Look for Hickory trees even after their leaves fall. You may be able to identify them by their bark and their buds. Hickories typically have a single large end bud at the tip of their branches that is usually quite distinctive, different for each species. There are smaller buds spaced alternately along the length of the branches. Mockernut Hickory buds are somewhat rounded, echoing the curved pattern of the bark ridges. Mockernut Hickory (Carya tomentosa) branch in winter. Notice the large end bud with rounded sides. Shagbark Hickory usually retains contrasting bud scales, which you might think of as being reminiscent of the shaggy bark. Shagbark Hickory (Carya ovata) bud. Notice the scales hugging the sides of the bud. Bitternut Hickory buds are a bright mustard color that is difficult to mistake for anything else. Bitternut Hickory (Carya cordiformis), showing its distinctive mustard-colored buds. As winter turns to spring, watch for these buds to swell and unfold like flowers. Mockernut Hickory (Carya tomentosa) leaves unfolding in spring. The range for Shagbark and Bitternut Hickory includes much of the eastern two-thirds of the United States, and Ontario and Quebec provinces in Canada. Mockernut’s range is similar, but it does not include the Canadian provinces, or some of the northern tier of the United States. Enjoy the colorful foliage while it lasts!